I See by the Papers...: 1906 EARTHQUAKE: WHO DESERVES RELIEF MONEY? 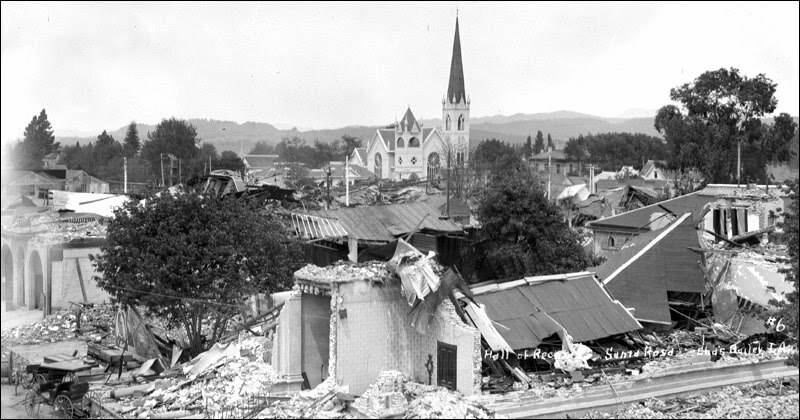 In the wake of the 1906 earthquake, generous Americans everywhere opened their wallets to help Santa Rosa, many likely spurred to action after reading the wildly inaccurate stories that appeared in the national press during the first days after the disaster, claiming the town was completely wiped out with many hundreds dead and the shelterless survivors huddled together in the Rincoon [sic] hills. The Los Angeles Times donated $10,000, as did Standard Oil; the mayor of Sherman, Texas chipped in a hundred bucks, as did a bank in Santa Rosa, New Mexico. The money piled up quickly. In the first two weeks nearly $31,000 had been donated, with over $44,000 given before a full month had passed. The Santa Rosa earthquake relief fund had found swift current in the Money River. But few knew at the time that Santa Rosa was liberally dipping into the fund for everything except humanitarian aid. Only about $2,000 had been dispersed to the needy, while over five times as much was paid out to workers cleaning up earthquake debris. As year end neared, the donation total was over $60,000 - an enormous bankroll for the day - with about forty thousand still in the bank, unspent. The town's stingy attitude with donated cash mirrored exactly the food relief debacle, where Santa Rosa shut down the soup kitchens 17 days after the quake except for aid to "widows, orphans and the sick," deciding it was better instead to hoard tons of donated food in a warehouse. Except for a small item in the Santa Rosa Republican five weeks after the quake ("These funds are used in relieving all cases of distress that the committee discover..."), there was little mention of the relief fund in the papers. That is, until the Sunday before Thanksgiving, when the fund hit the fan. Finley also remarked that most of the money in the fund "was subscribed through a misapprehension as to the facts" due to those wacky early wire stories - more the fools, they, for believing Santa Rosa really needed help. Given that everything's so swell, Finley asked: What should we now do with our lovely windfall? It was a straw man posit, knocked down a week later by our (anti)-hero, James Wyatt Oates. All that money was sent to aid Santa Rosa:, he argued: "I [cannot] see how it can be considered in any sense an indigent relief fund. It was sent here to meet a present emergency and if it can't be use for that it should be returned to those who sent it." Because "there are not enough personal necessities resulting from the earthquake to absorb all of it," Oates concluded, Santa Rosa should either refund the donations or turn it into a building fund. A vigorous debate about the fund followed in both newspapers. Santa Rosa Republican letter-writer "G" - probably county historian Tom Gregory, judging by the wit in the writing - asked, "If almost $10,000 could be spent for clearing the brickbats from Fourth street, why cannot $10,000 be taken from the surplus of $40,000 for individual relief?" Another letter to the Republican pointed out that the town was mostly using the money to provide downtown property owners with free labor: "The land owners have been benefited by a goodly share of the money expended -- almost one-half -- over $9000, and the value of their property has been vastly enhanced by the removal of the debris which we are glad to be rid of at any price, but there are others." Ever Scrooge-like, editor of the Press Democrat Ernest Finley penned a long editorial that argued that those injured or survivors of those killed didn't deserve anything more from the fund: "Strictly speaking, no person who is now able to look out for himself is rightfully entitled to one cent of the relief money remaining on hand, no matter what his financial loss was by reason of the disaster." The back-and-forth continued for a week, and the transcriptions below are well worth reading (not every editorial and letter is included here, but all points are mentioned). Finley became increasingly isolated in his position, reduced to splitting hairs over the definition of "distress" before slamming shut the door by declaring "no more communications dealing with the subject will be published in these columns" - but not until after publishing one final letter urging Santa Rosa to "borrow" the relief fund to pay for a new city hall. ...Consider the widow whose husband was killed trying to save others and who has a half dozen children to be supported. Who will say that less than five thousand dollars of that fund belongs to her and should be placed in her hands. Suppose $2500 each were handed to the two women who lost a leg each on that eventful 18th April. Is this any more than their due? Will it make beggars of them to receive this money? Let those who think so stand up and give the people opportunity to look at them. There is the lady who was in business here and is likely to be an invalid all her days from injuries sustained by the earthquake. Considering the condition of the relief fund on hand, who will say that she should receive less than $2500 to $4000, not as charity, but as her due. That widow with the six youngsters was Mrs. Milo Fish, whose late husband was the Press Democrat printer fatally injured in the newspaper building's collapse. Mrs. Fish was now working at the paper, learning to be a printer herself. With a diplomat's tact, Lemmon cut to the cold heart of Finley's argument: Was he saying that even this member of the Press Democrat's business family was undeserving of one cent of the money donated to help relieve suffering? Second on the list, with $2,500, was Mrs. Nellie F. Fish. Not another word critical of using the fund for charitable purposes appeared in the Press Democrat. Sonoma County Town Badly Pressed as Result of Disaster. Wants Coin to Carry on the Work of Reconstruction. SANTA ROSA, May 12--There are now about 500 refugees in Santa Rosa from San Francisco and more are arriving almost daily. The question of feeding and caring for these people will soon have to be faced by the city, as there is little outside aid being received here. The promise of $15,000 assistance from the San Francisco relief funds, made soon after the earthquake, has been reduced to $5000, owing to the inability of the relief committee in San Francisco to secure any part of the Congressional appropriations. The heavy additional expense saddled upon this little city for extra police, sewer work, cleaning streets, removing debris, repairing water system [sic], inspecting chimneys and buildings and the replacing of destroyed property, taken in conjunction with the fact that the assessment roll has been reduced several million dollars, makes the question of finances a grave one. The work of clearing the debris is proceeding rapidly, and already several burned out property-owners have begun the construction of temporary structures on the site of the old buildings. On all the side streets leading to the burned portion of the city numerous one-story frame buildings are being erected for temporary use as stores. This gives the city the appearance of a mining camp of the days of '49. The total amount of cash contributions to the city's relief to date is $44,186.97, including the $5000 from San Francisco. This will not pay one-third of the expense incurred in clearing the streets. The Republican is in receipt of several inquiries in regard to the relief funds in this city, who holds them, how they are held, how used, etc. The funds are in the hands of the treasurer of the relief committee, Mr. James R. Edwards. They are not deposited in any bank as a part of its funds, but are kept in a box in the safe deposit of the Savings Banks of Santa Rosa. It shows a nice sense of honor on the part of Mr. Edwards and Mayor Overton that they are thus held. Any and all of these funds are thus available any moment they may be demanded. These funds are used in relieving all cases of distress that the committee discover. There may be cases about which there is a difference of opinion. There have been efforts on the part of some people to impose on the committee and the committee may have made some mistakes, but we have every reason to believe that its members are trying to get at the facts and do what is right in the premises [sic]. It is a good use of some of these funds to give employment to men who would otherwise be idle and have to receive this money as charity. It would be a good use of others of these funds to pay the taxes on the little homes of the destitute in our midst. Such people should be searched out and aided. Often the most deserving are the slowest to ask for assistance. There should be no undue haste in getting rid of these funds. They should be expended as needed and not otherwise. There will be need of them when building operations are slack next winter and there is little work doing on the farms. There may be occasional legitimate calls for help a year or two hence and it will be well if there are funds on hand to meet such demands. The proper disposition of that portion of the relief fund still remaining on hand is a question now confronting the authorities, and it will have to be admitted that the problem is a difficult one to solve. Something like sixty thousand dollars was subscribed to relieve the great distress believed to have been occasioned here by the recent disaster. A vast quantity of food and clothing was also sent in by generous and noble-minded persons from all parts of the country. The food was, in the main, speedily distributed where it would do the most good. Most of the clothing was also put to good use, although a considerable supply still remains on hand, carefully packed and ready to be given out during the winter if occasion should require it. Approximately twenty thousand dollars of the money sent in has been expended in the proper and legitimate relief of distress, and something like forty thousand dollars yet remains on hand. What to do with it its a question [sic]. Naturally the first thought is that it should be expended as the donors intended--for the relief of those in distress and to reimburse those who suffered loss by reason of the calamity. But there is no distress. And the greater part of the loss fell upon those who were in a position to stand it--or, if not, are now fully able to look out for themselves and feel neither the need nor the inclination of becoming objects of charity. In San Francisco thousands of poor people lost their homes. Here they did not. The property destroyed in Santa Rosa was business property--brick and stone buildings owned for the most part by corporations and persons of means. The fire spread and burned a few residences, but probably not more than half a dozen altogether, and on most of these full insurance has since been paid. Those who owned homes before the shake have have them still, if we except two or three improperly constructed dwellings that were so badly shaken that they had to be torn down. Practically all of the merchants who lost their stock of goods have since re-established themselves in business. For a brief time many persons were thrown out of employment; but individual contributions, relief from fraternal organizations, affiliated labor unions, etc., made up this loss to a very great extent, and since that time there has been more work at better wages for those who labor with their hands than ever before in all the history of the city. Everybody who will work is working, has been working and can continue to work as long as he chooses, and for that work receive the very topmost wage. So the fact of the matter is that, with hardly any exceptions, those who suffered injury are in no need of assistance and those who suffered not at all are really better off than they ever were before. There is a better demand for their labor, and there will continue to be for a long time to come. To put the matter plainly, most of the money subscribed for the relief of Santa Rosa was subscribed through a misapprehension as to the facts. It was reported, and the story was published all over the world, that ten thousand people were homeless, and more than a thousand killed. Naturally the first impulse of every generous-minded person was to put his hand in his pocket and give something to relieve the awful distress bound to result from such conditions. But the report was not correct. Sixty-nine people were killed, it is true; but they have all long since been given proper burial, and as far as we are aware there is no instance where assistance is more or less generous measure has not been extended to those dependent upon the victims wherever such seemed called for or would be accepted. It is probable that more might be done in this line. It is also possible that some additional opportunities for legitimate assistance may yet develop. But even so, this would not begin to use up all the residue of the relief fund yet remaining on hand. And what is the best disposition to make of this residue? There is no way to send it back and insure its reaching the thousands of persons who subscribed it. What shall we do with our relief fund. That is a question and one that appears to grow more difficult to solve each time it is given serious consideration. Editor Press Democrat: It strikes me that most of those who have expressed themselves as to the disposition of the Relief Fund now on hand, take much narrower views than the facts would justify, while some are downright illogical. One, for instance, taking a narrow view of the spirit of the donation, denies that we may use any of the fund for other than mere cases at least smacking of indigency, and advocates holding the fund till there is some great disaster somewhere else, and then donating it there. It is difficult to see how, in that event, we would have the right to use this fund as our donation to another place. It certainly was not sent here with any idea if creating a future general relief fund. Nor can I see how it can be considered in any sense an indigent relief fund. It was sent here to meet a present emergency and if it can't be use for that it should be returned to those who sent it. I deny emphatically that all cases for which it was intended have been supplied. And I deny that it was sent here with any idea of indigency in it, or in its application. I would not do the generous donors the injustice to attribute to them so narrow a spirit. That money was sent here to help meet the pressing losses from the earthquake and no doubt it was intended that every dollar of it be used for our people in such manner as the authorities should determine to best relieve the hardships of that catastrophe. And I am in favor of so using it. There are many cases here in this city where people suffered losses who could ill afford it, and many are restricted in their living conditions by reason of it. These cases should be relieved from this fund. In my opinion the Council has been too narrow in applying this fund. They have apparently drawn the line as nearly as they could at indigency, and, as I have said, this is not in harmony with the spirit of the donation. This city as a city has lost heavily. Her buildings were destroyed, and we have no money on hand with which to rebuild. It is all well enough to feel a great pride in the town and to wish to rebuild without assistance. But when we remember that this means higher taxes, falling largely on those who lost most heavily, and who to rebuild, in many instances, have had to borrow money and incur debt, it presents another question. What between the interest on the one hand and higher taxes on the other, the man who is trying to restore the town, will have no merry time. If the narrow view of the spirit of this donation prevails we can not use any of this fund for city purposes. But if the other view is correct, then we can and should do so. To my mind there is no question but that the spirit of the donation amply covers just such a use of enough of that fund for such purposes, provided, however, there are not enough personal necessities resulting from the earthquake to absorb all of it. But be all this as it may, it is clear to my mind that nothing can be gained by this discussion; that the Council should determine for what uses it can properly apply the fund, then go ahead and so dispose of it, and either use it or send it back to those who sent it to us, and this should be done without delay and without making a "blowing horn" of the matter. James W. Oates, Santa Rosa, Dec. 1st. ...Reynolds suggested that the money was going out pretty rapidly, and that a considerable sum had already been distributed. He suggested the removal of the clothing and provisions to a location down town, where the people could secure them more conveniently. 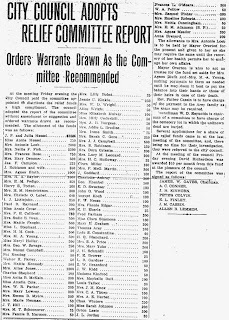 John L. Jordan addressed the council saying he knew a number of children who would be glad of some of the garments that are now piled away securely in the warehouse. Editor Republican: The relief fund question appears to be getting down out of the air and onto something of a substantial basis. Mr. W. E. McConnell struck the key note and Mr. J. W. Oates played well upon it in their published letters. The first writer suggested that the real sufferer of the earthquake and fire be hunted up and relief be extended to them, and the second gentlemen advocated the same method of putting the money where it would do practical good. In round numbers $60,000 was received here for relief and practically only a small amount of that grand sum has been given individuals who lost limbs, houses, and other property in the disaster. Looking over the printed report of the relief committee we read, "Special police, $764; inspecting chimneys and sewers, $545; picks, axes and shovels, $517; repair of water leaks, $175; carrying water, $70, temporary quarters for city officials (by what authority did the City of Santa Rosa pay for the housing of her officials out of the relief fund?) $169; paid for labor unloading cars, $783; cleaning and hauling debris from streets, $9241. 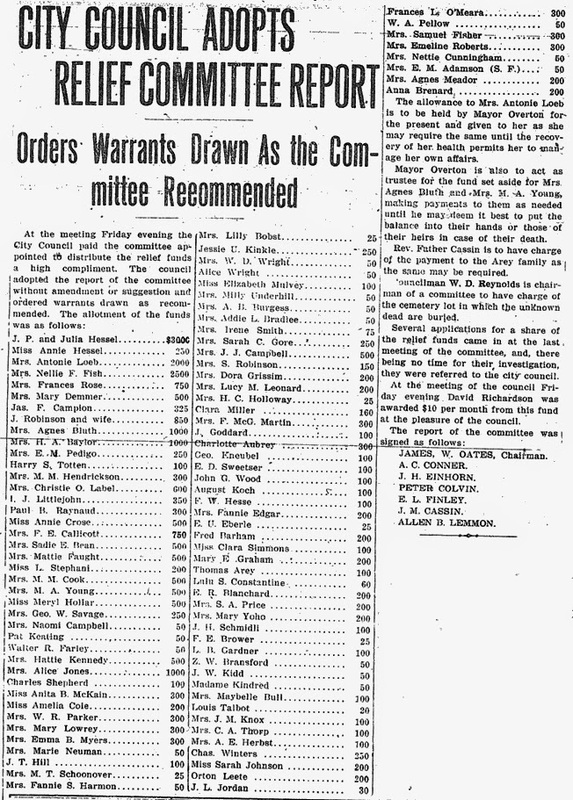 I am not disposed to find fault with the list of expenditures, as many of these dollars were worthily handed out, but it may be seen that in many instances the committee gave freely--quite freely. Did the same liberality generally govern the relief extended individuals. Mr. Oates writes around that point when he says that it is not necessary for the suffer to be a beggar for the actual necessaries of life before he or she is a fit subject for help. While the committee doubtless has tried to be careful in the distribution to individuals, it has apparently gone to the other extreme and almost niggardliness has characterized its actions. This is not by any means an unpardonable sin, but would it not be well to unloosen a little and do a little actual relieving. The time has long gone by when a piece of bacon, a paper bag of flour, a loaf of bread for a family of five, or a pair of second hand shoes was relief. The food and the "old clo" question has been settled. Five thousand dollars--actual cash--should now be in the hands of those who lost legs, lost all or a part of homes, lost the bread winners of families. Doctor bills (doctors are always on the suffering list) could be paid, taxes (Lord knows they are calculated to make everybody suffer) could be paid, dwellings could be repaired for those who are yet living in shattered houses. "A little seeking would soon find a place for that five thou', I imagine. If almost $10,000 could be spent for clearing the brickbats from Fourth street, why cannot $10,000 be taken from the surplus of $40,000 for individual relief? That coin cannot be returned pro rata to the actual givers. In the case of the large sums it could be done, doubtless, but what of the small contributors--the generous people who handed their respective relief committees $1, $10, and $5 pieces with "no name attached? Charity is not strained and often not named. Would it be fair that these should miss the return of their contribution? The idea is not practical nor practicable. At least, let us finish the work of hunting up the earthquake sufferers of Santa Rosa before we talk of hunting up the contributors of Omaha, Chicago or New York who sent us their Donations. Editor Santa Rosa Republican: It is almost amusing to read some of the suggestions for disposal of that much discussed but seemingly immovable, relief fund; that fund which could make glad the hearts of many who have been depressed and disheartened by losses paralyzing by their extent and completeness; that fund which lies idle in the bank...I have not heard of any judge in the state of California who has been deprived of any part of his salary by reason of the nearly two months of legal holidays following the earthquake; neither have I heard or read that any salaries paid during that time to the judges have been returned to the treasury. Neither should the salaries have been returned; the judges were entitled to them under the law, but they should be a little more sympathetic toward those who lost everything, business as well as property, and had no fat salaries to fall back upon. ...[S]omething special [must] be done for those permanently disabled. In addition to what has already been one, is most timely. Nurse hire at the Santa Rosa Hospital, supplies, medicines, etc.,. furnished the same hospital for the injured aggregate an expenditure of $1215.63, while cash relief on account of injuries amounts to $2020.60, making a total of $3236.23 to date of report. Surely there are sufficient funds in the bank to enable the committee to give substantial aid to permanently disabled and suffering ones, and still have something for those who are sadly crippled by financial loss. Why should repairs of water leaks, repairs of fire alarm system and temporary headquarters for city officials be paid from the relief funds? Is not the city able to pay those bills? City taxes are certainly pretty high this year. J. Edgar Ross wants the fund to be distributed among the banks to draw interest, and eventually be sent to other sufferers. How does he know the money would ever reach those mythical sufferers? Probably their relief committees would find it as hard to distribute the money as others have. The land owners have been benefited by a goodly share of the money expended -- almost one-half -- over $9000, and the value of their property has been vastly enhanced by the removal of the debris which we are glad to be rid of at any price, but there are others. Some say, "Give the workman his tools and implements of labor if they were lost in the fire;" so say we all -- but what tools are more vitally necessary than the instruments and libraries of the physicians and surgeons and of the dentists, and the valuable law libraries of the attorneys? No one need accept help against his will. It hardly seems possible that the Standard Oil Company is wanting its contribution of $10,000 back again, nor are other contributors any more likely to be "Injun givers," so why these terrible scruples by those who lost nothing? Those who have been crippled, either physically or financially by the earthquake and fire, or either, are not objects of charity; they have a right to help from the fund which is theirs, and when, by the timely help given them, they become prosperous again, it will be their sacred duty, as well as their dearest pleasure, to extend aid and comfort to needy sufferers wherever they may be. Try them and see. ...Mention has been made of the fact that part of the relief fund was paid out for cleaning up debris. The purpose was to give employment to those who needed it. And the committee's books show that when this was done and people were put in a way to take care of themselves the appeals for relief were materially reduced--almost enough, in fact, to offset the amount paid out in the form of wages for having this very necessary work done. ...Strictly speaking, no person who is now able to look out for himself is rightfully entitled to one cent of the relief money remaining on hand, no matter what his financial loss was by reason of the disaster. Money contributed under such circumstances as those attending the catastrophe of April 18 is invariably subscribed with the idea of relieving actual distress--burying the dead, caring for the injured, feeding the hungry, clothing those unable to procure proper covering, and, after all this has been done, starting and assisting in the work of rehabilitation. If any of our readers feel inclined to take issue with this statement let them ask themselves how much money would have been sent in if the word had gone out that although a catastrophe had occurred here and great damage had been done, our people were fully able to handle the situation, and to take care of themselves. The money was sent because our people were believed to be helpless. There is only one course to pursue with reference to the relief funds now remaining on hand, in our opinion. That is to distribute a reasonable portion of the money to those injured or damaged to such an extent that they are now unable to properly care for themselves, retain which seems likely to be needed to meet further requirements, and, if there is anything left after doing this, put it aside in the form of a permanent relief fund to be used either here or somewhere else in the event of another calamity, as occasion may suggest. As far as the clothing and supplies are concerned, they will doubtless all be disposed of before the winter is over, and without any hullabaloo either. On Sunday morning, November 25th, the Press Democrat discussed the relief fund remaining in this city and asked what should be done with it. After remarking that at first thought it would seem the relief fund should be expended as the donors intended, "for the relief of those in distress and in reimburse those who suffered loss by reason of the calamity" our contemporary declares, "but there is no distress." In the same article the morning paper referred to the matter of receiving aid by certain persons that they "feel neither the need nor the inclination of becoming objects of charity," clearly inferring that those receiving relief funds are objects of charity. Also, it was alleged that the fire burned "probably not more than half a dozen residences, on most of which full insurance has since been paid, and that only two or three improperly constructed residences were so badly shaken that they had to be taken down." The intent of the article was clearly to convey the impression that relief work here was practically closed and that some disposition outside of relief should be made of the funds on hand. This Friday morning the Press Democrat has another editor--one who did not know or remember what the paper published editorially on this subject a couple of weeks ago. It is now announced that the committee is actually paying out $500 per week. Two weeks ago that paper stated that there was "something like" forty thousand dollars in the relief fund and now it puts the fund at only thirty-five thousand dollars--indication that places have been found recently to put some of these funds. In the last article our contemporary declares "Strictly speaking, no person who is now able to look out for himself is rightfully entitled to one cent of the relief money remaining on hand, no matter what his financial loss was by reason of the disaster." This is certainly a very narrow view to take of this matter. It is not the view of the people who sent the money to this city. It appears to us to be the view of such people as regard relief funds as charity funds. These funds were sent here for the earthquake and fire sufferers. They are not the funds of the self-constituted committee having charge of them and who stand in the way of a large number of people here getting what they are entitled to, what was sent here to be used by them. Consider the widow whose husband was killed trying to save others and who has a half dozen children to be supported. Who will say that less than five thousand dollars of that fund belongs to her and should be placed in her hands. There are several others who might be named and the relief committee should hunt them out and give them as they deserve. Regarding the residences seriously damaged by the trembler, instead of being but two or three of them, there were many times that number. After personal injuries are provided for liberally, something should be done for those who lost their homes--not as charity, but as their due. Gentlemen of the relief committee, quit thinking that it is your duty to stand as with bludgeons in your hand to prevent people getting their due in this matter. Do not be misled by any newspaper as to your duty in the premises. Be as liberal in the distribution of this fund as were the people who sent it here. If you show such liberality the funds on hand will soon be distributed to those who are entitled to them. Editor Republican: Here is a good chance for the use of some of that surplus relief money. An elderly woman who lost a foot when her brick wall fell on her April 18th is in more trouble. Yesterday an attachment was levied on her household furniture--all that remained after the fire and earthquake--and in a few days in all probability she will be sold out of what is left of her home. I will not here mention her name, but the relief fund people can learn who she is. The claim against her is only a few hundred dollars, and surely out of that $38,000 this trifling amount can be wiped away. This unfortunate woman is almost helpless, and hers is a case demanding instant relief. Editor Republican: I would like to add just a word of explanation. My suggestion in regard to the relief fund was based upon the statement of a local paper to the effect that the distress occasioned by the earthquake and fire has been relieved. If representations made since are credible--and I have no reason to doubt it--the assumption upon which I based my recommendation is not supported by the facts in the case. There seems yet to be a great deal of distress and if the money was not contributed for its relief, I cannot conceive what object the donors had in view. I heartily concur in Mr. McConnell's presentation of the matter. I trust that I have as much sympathy as any one for the unfortunate. Our frequently hysterical and not always well-balanced evening contemporary now tries to make it appear that in its reference of relief fund matters The Press Democrat has been inconsistent. Judge Burnett, in reversing himself on the matter of returning the unused funds to the donors, also attempts to pass something of the kind up to this paper upon the grounds that we declared that "the DISTRESS occasioned by the earthquake and fire had been relieved." We did so declare, in a general sense; and we declare so still. In the article referred to by Judge Burnett and The Republican we expressly state, however, that in all probability more might very properly be done in the way of extending additional aid to those who had already been assisted. Also referring to the assistance that had been extended those dependent upon the unfortunates who lost their lives in the disaster, we said: "It is probable that more might also be done in this line." It all depends upon the interpretation put upon the word "distress." Our position is and from the first has been that there is but one meaning to the word, and that the money contributed was, strictly speaking, sent here with the idea of relieving distress rather than for the purpose of making up the shortage in some man's insurance, helping another to reconstruct his brick block, or paying for the rebuilding of somebody's chimney--unless, of course, he is unable to do it himself. But some, it would appear, think differently. The Republican charges us with attempting to influence the course of the committee. It is difficult to see how this could be true, when our position all along has been that the committee is and has been doing good work, should be let alone, and is entitled to the support rather than the criticism of the public. It is The Republican that has been trying to dictate to the committee what it should do. This paper has taken a directly opposite course. And so far we have not heard that the attitude of the committee has been materially changed by the comments of the local press. The members of that body appear to have gone calmly or doing what they thought was best and extending whatever aid they could, regardless of what has been said, just as they have been doing ever since the morning of the disaster. So far they do not appear to have felt called upon to make any reply to the criticisms offered, and it might be proper to state here that in expressing itself on the situation. The Press Democrat has neither consulted with nor been influenced in the slightest by that body or any of its members. After making a few investigations of our own accord we were forced to the conclusion that most of the censure being directed toward the committee was undeserved. And being of that opinion we said so, giving our reasons for so thinking. Whatever the disposition of the remaining funds made by the committee, we are inclined to believe that it will be fair and liberal, and satisfactory to the majority of the members of the community. Editor Press Democrat: I read with great interest a few inquiries and views of some of our people as to what to do, and what should be done with the money received for the relief of those who suffered...could not a very few men soon pick out the ones in Santa Rosa who are in need of this money, who have been thrown out of business for months and some entirely. Now, this was sent for their relief. Why not give it to them? ...the generous people of Santa Rosa suffered more loss than all the money sent to the City of Roses will amount to. So how would it do to begin to hand out the balance of the money in the bank to those for whom it was originally intended. When our morning contemporary has exhausted its argument in a controversy and find itself beaten at all points, one of its old tricks is to throw up its hands and shout, "politics." In the discussion concerning the relief funds nearly all the writing has been done by Democrats, but they and all others are now invited to keep their letters away from the Press Democrat office. That paper publishes today a column from Judge John Tyler Campbell in favor of the city "borrowing" relief funds with which to build a city hall and at the same time declares "no more communications dealing with the subject will be published in these columns." Hon. John Tyler Campbell contributes a lengthy article to the Press Democrat in favor of the city "borrowing" a considerable sum of money from the relief funds for use in building a city hall. He proposes to have the money repaid by taxation at some future date. It will be time enough to discuss this project after the relief and deal liberally with all the fire and earthquake sufferers. Mr. Campbell puts up a peculiar and rather ingenious plea to the effect that the burden of building a city hall here will fall upon the laboring people of the city. He tells us the merchants add the taxes they pay to the price of the goods they sell and that rents are determined on the same basis. But the position taken in untenable. Tax is but a small item in the general expense of business. It cuts but small figure in determining the price of goods or the rate of rents. In fact, it is so small a matter that it is seldom considered in reaching a basis of prices. Take the matter of rents. It is not the will of the property owner that determines the amount he shall receive for the his of his building. Two parties are required in making a deal and both are largely controlled by existing conditions. Rents of business houses are higher here now than they were formerly because of the scarcity of such buildings and because they are being better built and costing more than was the case in the past...we are surprised at as intelligent a man as Judge Campbell taking so untenable a position. The burden of building a city hall will fall most heavily upon the property owners here and not upon the laborers. The laborers will get the first direct benefit, regardless of the source from which the money comes. The money in the Santa Rosa relief fund, amounting to nearly forty thousand dollars, is to be handled by a committee of citizens, to be appointed by Mayor John P. Overton. This matter was determined at the meeting f the city council Tuesday evening on suggestion of Mayor Overton. The chief executive stated that the council had sufficient work on its hands without going further into the relief work. The council, he said, had relieved the distress up to the present time, and the question of immediate wants having been solved, the best disposition of the funds was now of prime importance. He advocated the idea of a committee of seven, who would suggest the disposition of the funds and the amount to be given each individual case. W. A. Bolton communicated with the council, entering a protest against putting up a city hall with the moneys sent here for relief. He also protested against the apportionment of the moneys to all persons who lost in the recent disaster. H. M. Brace, chief of the subscription department of the San Francisco Relief and Red Cross Funds, asked the council for assistance in caring for the homeless and refugees in San Francisco. Mr. Brace reported that there were 12,000 people in the metropolis for for whom homes were being constructed, of which 6000 had been housed in complete structures. Five thousand people are being fed by the committee in Oakland and 1000 indigents were being card for at Ingleside. It was requested that the $5000 donated from the San Francisco relief funds to the relief of Santa Rosa sufferers be returned to the San Francisco committee. The relief committee having in charge the matter of passing on the claims growing out of the earthquake and fire in Santa Rosa, and the distribution of the relief moneys on hand, had a meeting Monday evening, which lasted until midnight. The committee made distribution of nearly $12,000, which makes a total of $19,000 apportioned by the committee so far. They still have about $11,000 balance on hand with which to meet other claims against the funds. The distributions made have generally been for bodily injuries suffered. The committee will meet again next Monday evening, and hopes to have its final session on that date. All persons who have claims against the fund that they wish the committee to consider are urged to have them on file before next Monday. The distributions are made subject to revision when all the claims have been filed.